The Army, to quote that age old sage of wisdom, 173rd Airborne Brigade Vietnam combat vet, Master Sergeant Jimmy Busby, is in Deep Kimchee. A correlation of forces are converging to create an Army that has severe personnel problems, limited knowledge of armored warfare, low morale, while also being eaten alive by severe social changes that are unprecedented in the history of the lean green machine. Under the Fiscal Year 2017 President’s Budget Proposal, recently released by the DoD, the active duty Army will be reduced from 475,000 to 460,000 in the next year. Army Reserve levels will drop from 198,000 to 195,000 and the Army National Guard from 342,000 to 335,000. These numbers are rapidly heading to the pre-World War II levels, when the active Army was at 440,000. The 2017 Budget would authorize funding for 56 brigade combat teams, the bread and butter of the US Army’s fighting capacity. The 56 BCT’s would continue to be high on light infantry training and skills and nearly non-existent on armored warfare fire and maneuver capabilities. The Army is extensively focused on nation building, peacekeeping and fighting low intensity conflicts in Iraq, Afghanistan and Syria with light infantry platoons. This philosophy is a result of nearly 15 years of infantry combat in the Middle East and policies in the Pentagon pushed by veteran bureaucrats like former Secretary of Defense Chuck Hagel who, in 2014, believed the Army should be focused on light infantry, special operations and cyber warfare, all backed up by air power. The Hagel Doctrine and its effects on the military continue to this day. In the most recent budget proposal by the President, PB 2017 will help provide our Army, Marine Corps, and special operations forces with greater lethality. The Pentagon is committing the fatal error of fighting the last war as new threats approach. The next war the US Army finds itself in, may very well be a massive combined arms slugfest, a fight that the Army would have a hard time fighting and an even harder time winning. No doubt, the US Army has spectacular Special Forces capabilities to be employed in the Middle East as well as light infantry combat knowledge, experience and strength to defeat anything ISIS could throw at us on the ground there. But, what happens if the US Army has to go to war against Russia, China, North Korea or even Iran? The Army would have to field armor heavy BCT’s that were capable of conducting fire and maneuver and acting as part of a combined arms operation. Could the US Army do it? It’s doubtful and that’s downright dangerous for the Army and the nation it has sworn to defend. As Lieutenant-Colonel Gian Gentile, noted in his excellent article, The Death of the Armor Corps. I have also heard reports from the field that the operational army has Armor (19K) Non Commissioned Officers as high as the rank of Staff Sergeant who have never qualified on a M1 Tank. Too, when was the last time that a heavy Brigade Combat Team has done a combined arms, live fire exercise integrating all arms at Brigade level? Do the Armor, Artillery, and Infantry Branches even have the collective knowledge to know how to do one anymore? My own experience as a Cavalry Squadron Commander returning from a combat deployment in Baghdad a few years ago mirrors these kinds of stories where I had lieutenants who had never qualified on a Bradley and a Squadron that didn’t know collectively anymore how to run a Bradley Gunnery Range. Such skills may seem insignificant but they are not because they indicate the collective knowledge and competency (or lack of it) of a tactical level combined arms formation. But, what if the American Army has to fight somebody in the future beyond insurgents laying IEDs and small arms ambushes that is usually handled effectively by infantry platoons? What if a heavy Brigade Combat Team in Iraq was told to pick up and head east and do a movement to contact into a threatening country? Could we do it? It would be hard to do such an operation without the intellectual framework of an Armored Force that the American Army used to have, but of late has gone away. In a nutshell, no, the US Army can’t do it. The US Army does not have the skill sets needed to wage armored warfare. So, what are we going to do if the balloon goes up against the Russians, Chinese, North Koreans or Iran? We are going to lose, that’s what’s going to happen. No amount of air power ever won a war alone, no matter what the Air Force will tell you. A roomful of NSA geeks fighting cyber wars are not going to take and hold ground. Adding to the Army’s manpower woes and zero capacity to wage armored warfare, is the ongoing social engineering that may be more of a threat than the Russian T-90 tanks Mr. Putin might employ against us. During the last seven years of the Obama Administration and the reign of General Martin Dempsey, until his retirement in September of 2015, the Army lifted its ban on gays, transgenders, established a policy for lactating females in the field, ordered male ROTC cadets to parade around in red high heels, directed males to conduct PT in pregnancy simulators, conducted white privilege training, provided soldiers with online classes teaching the Bible and the Declaration of Independence as sexist documents and conducted sensitivity training in war zones. But, the biggest nail in the coffin, in fact what is certainly the greatest disaster in US military history, is the forced integration of women in the combat arms and special operations; aka, infantry, armor, cavalry, artillery, the Green Berets, the Rangers, Delta Force. The senior leaders of the Army have said nothing as the Army has had this fiasco shoved down its throat by Ash Carter and the White House. No matter how many lies are told, no matter how many smoke and mirrors presentations are briefed, no matter how many dog and pony shows Ranger School puts on, the facts are the facts. Women simply are physically incapable of serving in the combat arms and special ops. A battlefield is a bad place to learn that you’ve been lied to by Hollywood, militant feminists and cultural Marxists. When the lactating mommies start coming back to the US mainland in flag draped sandwich bags, perhaps the airhead, naïve, dense, dumb, feckless, politically correct American population will finally understand that 90 pound, five foot nothing cheerleaders are no match on the battlefield for men. The Army and the military as a whole, has become thoroughly feminized by the Obama Administration. Obviously, the Army doesn’t need to focus on winning wars anymore. 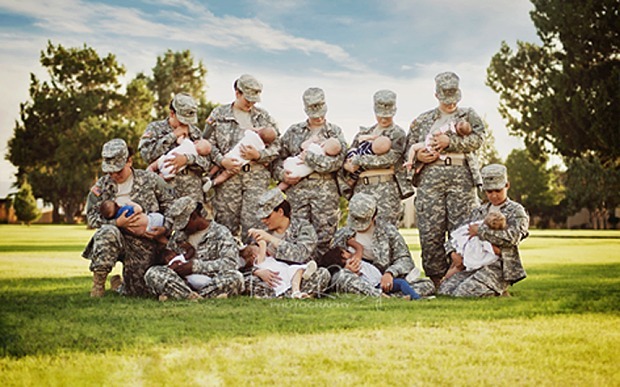 As long as there are day care centers, lactating stations, coolers for breast milk in the field, endless weeks of maternity leave and assistance for couples who want to start families; that’s what’s important in the US Army of 2016. Don’t worry about fighting wars. Leave that to the Russians and the Iranians. We’ll focus on turning the arms rooms into child care centers. Got a little extra room in the motor pool, a perfect place for a lactating station? Mommy tanker can pump some breast milk while her tank gets a new air filter. The Army’s morale is also in the toilet. That’s no surprise. The Army still has a large component of red blood American men and indeed many women, who have had it with policies that are turning the military into a Bob Fosse chorus line. What does the US Army need more desperately than anything? It needs leadership. It needs leaders who have the guts to tell the echelons above God bureaucrats that their policies are not cute and trendy, but death for the Army. The Army needs leaders who are not corporate lackeys, but instead, dynamic, strong willed souls who would rather fall on their swords, than see the US Army be destroyed in peacetime and in war. If the Army doesn’t refocus on armored warfare, if the Army doesn’t stop the social engineering and feminization that is anathema to the Army’s mission, the Army will cease to exist. This is what an Armor Corps looks like. M1A1’s and Bradley’s on the attack with well trained crews. Sadly, there is no way we are prepared for this type of combined combat. Instead of spending dollars on battle systems and training infrastructure, we are mothballing it. A general once told me it takes 10 years to equip and train a US Army Division. This was 20 years ago when we had more robust manufacturing in the USA. We are looking to probably double the time to two decades now. We need to stand up for our US Army and our national defense. It is time now for all veterans to find their voice and Be Heard!! While I loved the article. You forgot the first rule of this administration. Which is facts, logic and common sense play no part in the running of this country. Followed closely by rule two – it is the the responsibility of this administration to fundamentally change the U.S. By turning anything positive, right, moral and patriotic into a pile of shite. This is being done in compliance with UN directives through the UN’s “Freedom From War”, AKA: State Department Publication 7277. We are in Stage III of the plan and US Troops operate openly under UN command. For all intents and purposes, our military is a UN force. Our nations is BROKE. Why all the whining about cutting spending. We don’t need our military in over 500 bases around the world. What the USA has accomplished in the last couple of decades was helped along by the Chinese investment in our bonds. IE: The Chinese fueled our military expansion by loaning us money our government needed desperately to stay afloat. We can no longer afford to have the largest military on the planet, so stop whining about how Obama is destroying our military. Maybe you whiners haven’t kept up with some of the new developments in weaponry, some of it developed from back-engineering Alien Technology. You people who believe this is no more than tinfoil-hat crap need to get your heads out.